Many people across the globe are in need of quality palliative care (PC), of which a majority live in low- and middle-income countries. However, many still see their needs unmet. It is estimated that only 14% of people in need of PC actually receive it. To improve access to PC as a core component of health systems, the WHO developed evidence-based tools on how to integrate PC into national health systems, across disease groups and levels of care. 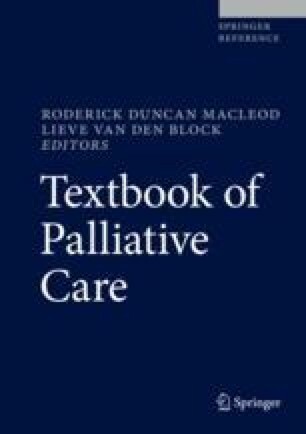 The current chapter provides an overview of this WHO Public Health Approach to Palliative Care, and discusses the seven components that were set out as a practical guidance for policy makers and program managers at national or subnational level to plan and implement PC services integrated into existing healthcare services. The components discussed are: (1) the development of appropriate PC policies, (2) the scaling up and integration of PC into the healthcare system, (3) the improvement of pain relief medicines access, (4) the strengthening of human resources for PC, (5) the establishment of palliative care services, (6) the setting of standards for evaluating PC services, and (7) the costing of PC services. World Health Organization. Planning and Implementing Palliative Care Services: A Guide for Programme Managers. World Health Organization. 2016. Connor S, Bermedo M. Global atlas of palliative care at the end of life. 2014. Available at http://www.who.int/cancer/publications/palliative-care-atlas/en/. Government of India. Narcotic drugs and psychotropic substances amendment act 2014. Gazette of India, 2014. Available at http://www.indiacode.nic.in/acts2014/16%20of%202014.pdf. Nemeth C, Rottenhofer I. Abgestufte Hospiz- und Palliativversorgung in Österreich. Vienna: Österreichisches Bundesinstitut für Gesundheitswesen; 2004. Available at http://www.hospiz.at/pdf_dl/oebig_studie.pdf. Task shifting: rational redistribution of tasks among health workforce teams. Global recommendations and guidelines. Geneva: World Health Organization; 2008. Available at http://www.who.int/healthsystems/TTR-Task-Shifting.pdf. World Health Organization. WHO model list of essential medicines, 19th list. [internet]. Geneva: World Health Organization; 2015a. Available at http://www.who.int/selection_medicines/committees/expert/20/EML_2015_FINAL_amended_JUN2015.pdf?ua=1. World Health Organization. WHO model list of essential medicines for children, 5th list [Internet]. Geneva: World Health Organization; 2015b. Available at http://www.who.int/selection_medicines/committees/expert/20/EMLc_2015_FINAL_amended_JUN2015.pdf?ua=1. World Health Organization. Planning and implementing palliative care services: a guide for programme managers [Internet]. 2016. Available at http://www.who.int/ncds/management/palliative-care/palliative_care_services/en/. World Health Organization. Questions and answers on universal health coverage [Internet]. WHO. 2018a. Available at http://www.who.int/healthsystems/topics/financing/uhc_qa/en/. World Health Organization. WHO definition of palliative care [Internet]. Geneva: World Health Organization. 2018b. Available at http://www.who.int/cancer/palliative/definition/en/.